Alvin Harper earned All-Southeastern Conference Freshman First Team honors in 1987 with the Volunteers, and All-Southeastern Conference first team honors in 1990. He was also the MVP of the 1991 Hula Bowl, and finished his NCAA football career with 103 receptions for 1,547 yards and 16 touchdowns. 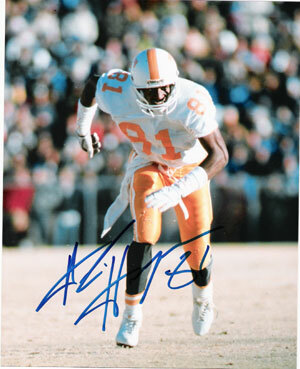 Alvin Harper has hand autographed this Tennessee Volunteers 8x10 Color Photo #81. Harper/GTSM Hologram and Certificate of Authenticity from Athlon Sports Collectibles.